Be the first to share your favorite memory, photo or story of Clara Mae. This memorial page is dedicated for family, friends and future generations to celebrate the life of their loved one. DURHAM: Clara Mae Colclough Bobbitt, 98, passed away on Thursday, October 4, 2018. She was born in Durham to the late Bryan Colclough and Minnie Blake Castle Colclough McGee. In addition to her parents, Mrs. Bobbitt was also predeceased by her beloved husband of 49 years, Phillip M. Bobbitt; and her beloved step-father, Joseph McGee. Mrs. Bobbitt was a member of Asbury United Methodist Church in Durham and the last surviving member of the Willing Workers Sunday School Class. She was a devoted wife and mother, and had a natural gift of putting others first. As a child, she had many fond memories of her summers spent in the country with her Aunt Luna. Mrs. Bobbitt is survived by her beloved son, Steven Phillip Bobbitt; and several nieces and nephews. She was affectionately known by several as Aunt “Cag” or “Caga”. A graveside service will be held at 2 pm on Tuesday, October 9th at Maplewood Cemetery with Rev. Wesley Neal officiating. In lieu of flowers, the family requests that memorial donations be made to Durham Rescue Mission: P.O. Box 11858, Durham, NC 27703; Asbury United Methodist Church: 806 Clarendon St., Durham, NC 27705; or Duke HomeCare and Hospice: 4321 Medical Park Drive, Suite 101, Durham, NC 27704. To send flowers or a remembrance gift to the family of Clara Mae Colclough Bobbitt, please visit our Tribute Store. 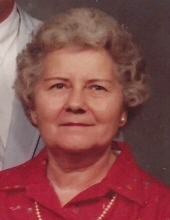 "Email Address" would like to share the life celebration of Clara Mae Colclough Bobbitt. Click on the "link" to go to share a favorite memory or leave a condolence message for the family.